06 February Offers a Varied and Exciting Lineup at Ce Soir – Ce Soir Arts – Be inspired tonight! I was oh, soooo right when I said of yesterday: “This is going to be a good day at Ce Soir, we can just tell!” It was wonderful from that incredible reading by Russell Eponym of some of the most beautiful poetry ever written. “The Love Song of Alfred J. Prufrock” by T.S.Eliot (for one!) is a favouite of Aeon’s. This is what he said about Russell‘s reading: “Those stream of consciousness poems and essays are a real challenge, and Russell had it – completely. The whole of his reading was outstanding, but his way with Prufrock…” Aeon was smiling and shaking his head in assent and amazement. We do have some extremely talented, world-class (metaverse-class?) artists amongst us here – right here in SecondLife. What a joy! This is what I wrote for yesterday’s blog. Just know – it all came together, just as we had dreamt it! TerryLynn‘s music was wonderful and that last song: a stunner. She’s coming back, so look to hear it again on this stage! Edward leapt to the piano again, just as we had hoped he would. His “Aria for a Princess” is priceless, just like his original rock songs. YES! What a show! Everything from a bit of country from TerryLynn (which was awesome, by the way!) to really hard rock and some sweet, sweet sounds from Edward. Oh, yes. We’ll do this again! First on the schedule is RUSSELL EPONYM who will be coming in at Noon SLT to share his velvet voice – but not in song. Instead, Russell has a collection of poems and readings for us, each one sure to delight. His professional knowledge of the arts is expansive and it encompasses music from a range of genres as well as literature and the other arts. Come enjoy Russell‘s recitation; sit beneath The Magic Tree and let him take you on a journey that will uplift and enchant you. He’s always got something special to share, so don’t miss this premier reading at Ce Soir. Who better to be first? It has to be Russell Eponym! At 6 PM SLT, well-known and beloved musician TerryLynn Melody will share her lovely voice with us for the first time. She performs music in an eclectic mix of covers from many genres and eras along with award-winning original tunes that keep her fans and friends coming back for more. Her 2011 CD “Watch That Turn” features her own work shared with notable musicians including Country Music Hall of Fame great Charlie McCoy. TerryLynn’s beautiful voice and versatility highlights her deep connection to the lyrical content of the covers she chooses and the originals she pens. Come enjoy a special hour with this lovely and talented musician; help us welcome TerryLynn Melody to Ce Soir in style! Putting a wrap on the night, rocker and all-round musical powerhouse Edward Kyomoon will keep you going from the first chord of his set to the last. This technical wizard brings much to his music – the voice, the lush guitar, piano…it’s all there for you to enjoy. Dance! Sing along! 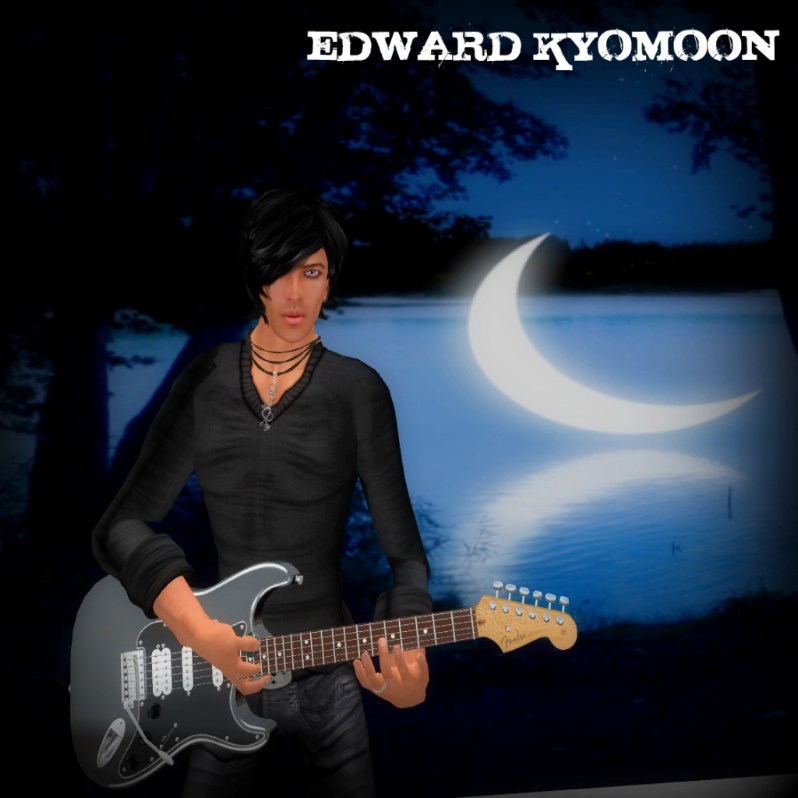 Edward‘s covers of such bands as Pink Floyd and Blue October will get your attention – and they are just the beginning. His originals are inspiring and, well, awesome to hear. This dymamo gives us his all in hard rock anthems, bluesy serenades and heartfelt love songs. You won’t want to miss a minute of Edward‘s energy, which is palpable no matter what he’s playing or singing; he truly is that versatile. See you at 7PM SLT, Ce Soir main stage! See, I told you it was going to be a good day at Ce Soir! Don’t miss it!